Schnabel’s playing of Beethoven’s Moonlight Sonata (15 bars) – Tempo analysis from Elaine Chew on Vimeo. Schnabel’s tempo variations in his performance of Beethoven’s Moonlight Sonata (15 bars). Vertical grid lines mark the beginnings of each bar. The arches denote phrase and sub-phrase groupings at different hierarchical levels. In Schnabel’s performance, the phrase arcs consistently cut across the bar lines, creating the perception of a long line. The phrase boundaries align with the bar line for the first time at beginning of bar 9, reinforcing the arrival of the new key (the relative major). More analysis videos at vimeo.com/elainechew. Musical prosody is the manipulation of timing, loudness, articulation, and timbre that a performer adds to an abstract conceptualisation of music (such as that notated in a score) in order to communicate ideas of grouping and prominence. Prosodic choice can often be explained as the result of desired parsing, subject to the structural constraints of the abstract music, and the acoustic properties of the musical instrument. Decisions of grouping and prominence, and of musical prosody form the crux of the art of interpretation, but it remains one of the most elusive elements in music pedagogy. The advent of scientific tools for representing and charting not only the music waveform but also acoustic features ranging from frequency and amplitude to tempo and loudness allows us to overlay and cross reference prosodic information from a performance with structural information in a score. 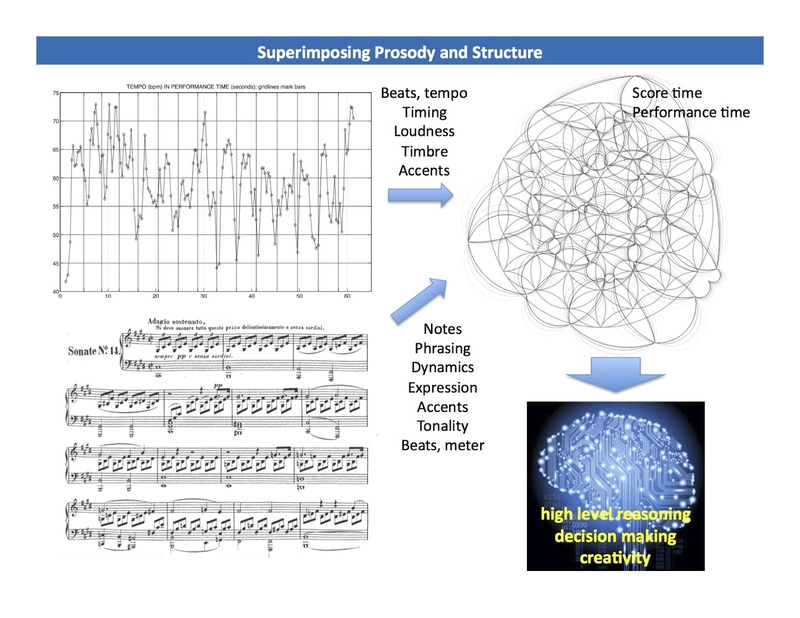 By synchronising these multiple layers of information, we make concrete connections between abstract time and pitch structures (such as measures and key), prosodic decisions (such as timing and loudness), and acoustic properties of the instrumental sound (such as sound decay time). The scientific visualisations become a tool to discover and explain prosodic choice and the underlying grouping and prominence decisions. A brief illustration of the technique using three performances of Beethoven’s Moonlight Sonata, by Barenboim, Pollini, and Schnabel will show how the performers’ different grouping decisions can be inferred from prosodic information. A more detailed study of prosodic choices in my recording and live demonstration of the Epilogue from Peter Child’s Doubles (1998-1999), how these decisions are constrained by the acoustics of the instrument, and expressive markings in the score, corroborated by the scientific visualisations will follow. By revealing the logic behind prosodic choices, we aim to make widely accessible the knowledge of creating new and informed interpretations. Kathleen Riley, The NYU Steinhardt School of Culture, Education and Human Development. In addition to many years of intensive instructive guidance and practice, music performance requires strength, coordination and fine motor control in order to realize performance intentions. To achieve optimal performance requires that we address the physical, mental and emotional aspects of each individual in order to allow their careers to flourish. While many teachers subscribe to healthy teaching methods, the problem seems to lie in knowing whether or not these methods have been integrated correctly into the physiological profiles of our students. In addition, the most efficient utilization of muscles is a necessary component when strain and injury may still be a concern. In sports training, this is widely accepted as one of the most important factors. This paper presents research on several high level pianists using multimodal biofeedback that enables pedagogues to see inside their students, collecting data that can not only give them insights for teaching, but, more importantly, can be provided as objective data to members of the medical community. The protocols I have developed and use through ProformaVision, a software program that simultaneously layers and analyzes multi-perspective videography with surface electromyography (sEMG) muscle tension recordings and MIDI data, can help to provide researchers and medical experts, as well as pedagogues, with data that can help focus on the cause, not the symptom. There are several factors that can clearly be seen as possible roads to injury, or, in many cases, just the cause of faulty technical approaches to passages. Now that we can clearly see hand position along with readings of muscle activity we can establish validity for what works correctly for each individual. Used as a student assessment tool, we can help bring awareness to students at all levels. In order provide a convincing performance a musician needs a story or plan. This is particularly true of Arnold Schonberg’s Op. 11, No. 3 for piano, for which the composer famously claimed to “not to have any intention”. The pianist needs the musical story to develop a mental map to tell her where she is in the piece and what comes next. Previous studies have tracked the development of musicians’ mental maps by asking them to report the mental landmarks or performance cues (PCs) that they attend to keep track of their performance and make sure that it unfolds as planned. In these studies the musicians reported their PCs once, at the end of the study. The pianist in our study (the first author), in contrast, reported her PCs repeatedly over a period of months as she developed her interpretation of Schonberg’s Op. 11, No. 3 in a series of public performances of Op. 11. We expected that, as she became more familiar with the piece, some established PCs would fade into background and new PCs would emerge. For this conceptually challenging piece, we expected new PCs to emerge in passages with which the performer was less comfortable, as she elaborated the musical story that guided her performance. The pianist reported her PCs four times. The PCs reflect the development of her understanding of the composer’s ideas which she accessed through analysis, the gestures/choreography needed to perform them, polyphonic listening, and “unconscious assimilation” (Dunsby, 1995). We will focus on the development of the first section – a strong “first statement”, and illustrate the process with performance/practice videos. The purpose of this qualitative pilot study was to extend research on musical practice; exploring how professional orchestral musicians prepare for a classical music premier. As a pilot study, several musicians who have been members of the New York Philharmonic for a full ­­­­­­season were interviewed at a location of their choice about practicing strategies used specifically when preparing a musical work for a premier, first performance. The research focusing on musical expertise thus far has been primarily focused on the development of expertise, identifying deliberate practice strategies with application to children learning to play a musical instrument or university students. Much less research has been conducted with true experts—in the case of music, professional musicians. Further, studying music for premieres adds an element of control to a naturalistic environment. There has been no opportunity for the performers to view the notation or hear the piece prior to receiving the music for practice. The research on expert musicians contributes to the knowledge in the field for both musicians and music teachers in how to quickly assimilate new music for which there are no aural models. One of the outcomes from the pilot study was the time-consuming measures a professional musician undertook in order to produce an aural model for themselves, when there was none. Pianists and piano teachers, more than any other group of professional musicians, have been wary of too much aural modeling, for fear of hindering the learning of note reading and stifling individual interpretation. The findings of the pilot study have important implications for pianists related to the use of technology and notation software for aural modeling and practice techniques involving rhythm and notation rewriting for reading simplification. Practice, classical music, premier, expert, professional. Historical recordings embody the material traces of performances from the past. As living testimonies of inspirational performers, recordings enthral modern listeners into a journey of discovery, yet as frail documents they can also pose challenges to our encounter with the musical past. How and why might we approach such rarities of performance history today? What empirical techniques of performance analysis can be purposefully used to guide the discerning ear? Moreover, how can the knowledge unleashed from the study of recordings be profitably implemented in practice-led research? My aim is to address these questions through an empirical case study of the neglected recorded piano legacy of Edvard Grieg. I employ computational techniques for performance analysis, including beat tempo, rhythmic data and spectrographic visualisations, based on both commercial sources and non-commercial transfers. (The paper draws from my doctoral research undertaken at the Centre for the History and Analysis of Recorded Music.) Using sound excerpts illustrated with performance analytical findings, I document Grieg’s style in a number of the Lyric Pieces and two movements from the Piano Sonata Op. 7, discussing the aesthetic implications of my findings for performance. Characteristic of Grieg’s playing is the multi-layering of tempo. Beneath the large-scale tempo lie more intricate gestures at the phrase- and bar-level, as well as sub-beat rhythmic inflections, which amount to a vitalist performance aesthetic. I compare Grieg’s style with other notable pianists who knew him, including Arthur De Greef, Fridtjof-Backer Grøndahl and Percy Grainger, and I also consider briefly contemporary interpretations, thus elucidating a broader historical framework of how pianists creatively negotiate the musical structure of this repertoire in performance. Through these approaches, I argue that empirical sound analysis of recordings supplemented by close listening provides a versatile medium for practice-led research and a potent historical-diagnostic tool for the performer-pedagogue, the didactic possibilities of which have barely begun to be explored. Key words: piano, recordings, Grieg, interpretation, practice-led research. Musical memorization is the processing of a piece of music for later recall without a written reference. Musicians, especially pianists, are required by convention to perform vast amounts of music without the use of notated music. However, musicians were not always expected to memorize for performance. In 1837, the 18-year-old Clara Schumann performed Beethoven’s Piano Sonata No. 23 in F minor, opus 57 from memory. A century later, performing the piece from memory would have been unspectacularly commonplace, but early in the nineteenth century, performing without the score was viewed as arrogant and ostentatious; focusing attention on the performer and the performance and away from the composer and the music. In the 1840s, Franz Liszt reportedly performed more than half his recitals by memory. Romantic virtuosity swept through the world of music and performing from memory inspired awe and endowed the performer with almost super-human powers. By the turn of the century, a pianist performing with score became the notable exception. This presentation revolves around discovering what social and technical considerations may have resulted in the expectation of a memorized performance. Preliminary work on this topic suggests that the practice of performing from memory was not endorsed at a time when sightreading and improvisation skills were prized. The virtuosity prized in the 19th century became manifest in memory feats while an emphasis on improvisation declined. It is important to note that there is evidence of musicians’ ability to perform from memory earlier than the 19th century, but that the practice was discouraged. This historical research provides background and context to pianists and psychologists studying memorization. Memorization, Performance Practice, Expertise Development, Virtuosity, Historical. Jennifer MacRitchie & Alessandro Giusti, Conservatorio della Szizzera Italiana, Lugana, Switzerland & Dalle Molle Institue for Artificial Intelligence. Piano touch describes the tool with which pianists can relate to their instrument, with tactile and aural feedback providing a number benefits in terms of timing and sound production. However, particularly in the learning stages, the relationship between gesture and sound is not always clear. From previous work on current piano techniques used in European conservatoires, it is noted that pianists use gestures to express a certain desired sound, mood or atmosphere for the music being performed. This research aims to study the variation in pianists’ movements as they are manipulated in order to produce different sounds. Two professional pianists were recorded performing four pieces of repertoire comprising various styles. They were asked to perform each piece in four different conditions: first a normal performance manner constituting the performer’s own interpretation of the piece, then performances with the sound intentions of dolce cantabile, deciso marcato and con dolore. Video-based and image processing motion capture techniques were used to look at motion of the wrist-arm-shoulder system and position of the fingers as the pianists used their body to realise these different sounds. These movements were then correlated with various audio measures of both overall dynamics and key velocities in order to map the gestures through to their produced sounds. Results show marked differences between the performing conditions for each pianist for movement features in the upper arm and also the rigidity of movement within the hand, with differences in gesture observed between pieces of repertoire. In 2009, one of my students won the first place at a national piano competition (São Paulo, Brazil) which, to my delight, included also a prize for the teacher-a week in Warsaw, Poland during the 2010 Chopin Piano Competition, tickets and all. Since its inception, this competition in Poland has been a reference and a standard setting for the performance practices of Chopin’s music. I also noticed that the Barcarolle op. 60 (1845) seems to be a constant among the prizewinners over the years. Performances however are far from being fixed events, since change tends to occur not only between renditions of the same artist but can also become significant over the years and decades (Bowen, 1996). Comparison of recordings point out to noticeable differences and modifications in tastes and decision making processes in performance practices. Concurrently, since 2008 I have been engaged on the study and memorization of this remarkable work following Roger Chaffin’s Performance Cues (Chaffin et al, 2002). The initial resolve to learn and memorize the Barcarolle has since developed into a fully documented longitudinal study supported by analysis of performances (recordings), analysis for performances (Schenkerian analysis) and analysis of my own performances following concerts and at lab situations (UCONN-residency 2012). Chopin was not known for keeping strict time such as Mendelssohn reportedly was (Brown, p. 384, 2002). The manipulation of temporal structure through subtle and yet constant use of ornamented figures and all manner of embellishments must be negotiated within the rhythmic frame of the Barcarolle. This constitutes a rich field of study for the performer in the sense that one must deal with placement or, more often, time displacement within beats, measures, hypermeasures and phrases. I propose to closely examine how Chopin competition winners of the last sixty years have dealt with this all absorbing question. Chopin’s ornamentation; rhythmic placement; double trills; distribution of note values; rhythmic frame.